The Strip in Las Venturas. The Strip is a palm tree-lined boulevard in Las Venturas, San Andreas that serves as the primary access to the city's numerous casinos. It is modeled after the Las Vegas Strip in Nevada, and like its real-life counterpart, is filled with neon billboards, tourists, and Elvis impersonators. Up The Strip near its northern terminus is the Old Venturas Strip, which houses the city's original casinos. 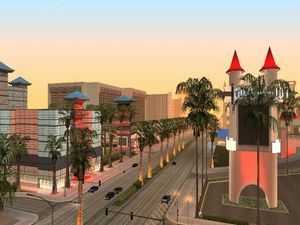 The Strip is the location of Wu Zi Mu's The Four Dragons Casino and of Caligula's Palace, both very important locations in the later parts of the storyline of Grand Theft Auto: San Andreas. When Carl Johnson arrives in Las Venturas, his luck begins to change for the better. His new associate, Wu Zi Mu, has set up his new headquarters in The Four Dragons Casino on The Strip, and is battling mafia families with interests in their own casinos who are attempting to sabotage his new business. Carl discovers that the Sindacco Family is responsible for Woozie's woes by tying Johnny Sindacco to the hood of a Feltzer and driving insanely from the Four Dragons Casino on The Strip until Johnny inadvertently blurts out his family's name while in a state of terror. During Carl's assistance in establishing Woozie's casino as a prominent business venture, he and Woozie being planning a heist of Caligula's Palace, just up The Strip. Because the Sindacco Family is vying for control of the casino with the Forelli Family and the Leone Family (who has recently taken over), Carl's new associate in Las Venturas, Ken Rosenberg, becomes a valuable ally. Rosenberg, who has been acting as a go-between for the three families, helps Carl establish a relationship with Salvatore Leone, allowing him to get closer to the casino's new ownership. After careful preparations, Carl and Woozie's men make their way up The Strip to Caligula's Palace and penetrate the casino's main vault to steal a large sum of cash, which is shared among the planners of the heist. The location of The Strip on the map, seen here highlighted in yellow.